The Honourable Deborah M. Gass is retiring after 27 years of serving as a Judge on the Provincial and Family Courts, and later the Supreme Court of Nova Scotia (Family Division). Her last day on the job will be July 31, 2018. Justice Gass was first appointed a Judge of the Family Court on November 15, 1991. Eight years later, on March 30, 1999, she was appointed a Justice of the Supreme Court (Family Division), where she remained for the rest of her judicial career. She elected supernumerary status on January 20, 2015, continuing to serve part-time primarily in the Halifax region. Born in New Glasgow, N.S., in 1950, Justice Deborah M. Gass attended Mount Allison University, and later Dalhousie University, where she received her LL.B. in 1974. That same year she was declared the winner of the Smith Shield Mooting Competition, an annual mock judicial proceeding put on by the law school. Justice Gass was admitted to the Bar in Alberta in 1975 and two years later in Nova Scotia. 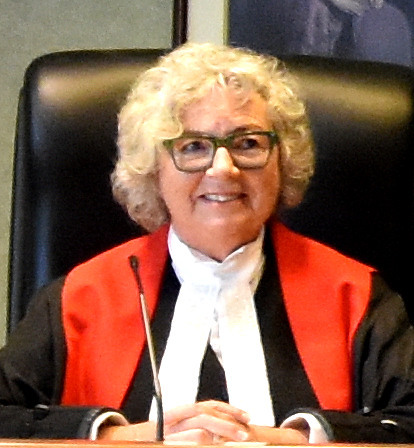 She practiced in Amherst from 1977-78, serving as the Executive Director of Penitentiary Legal Services, and later with Nova Scotia Legal Aid, until her appointment to the Bench in 1991. During her time as a lawyer, Justice Gass served in several executive positions with the Cumberland County Barristers' Society and was also the Provincial Representative for the Nova Scotia Barristers' Society. During that same time she served on various professional committees, including the Bar's Discipline Committee. Justice Gass was first appointed a Judge of the Family Court of Nova Scotia on November 15, 1991. Eight years later, on March 30, 1999, she was appointed a Justice of the Supreme Court (Family Division), where she remained for the rest of her judicial career. She elected supernumerary status on January 20, 2015, continuing to serve part-time primarily in the Halifax region. Over the years Justice Gass has been active in her community, including the United Church of Canada and the Rails to Trails Association. She is a former member of the Board of Regents at Mount Allison University, the Board of Governors at Pine Hill Divinity College and the Citizens Advisory Committee at Dorchester Penetentiary. She was also involved with the province's Working Committee on Restorative Justice. There are many activities Justice Gass enjoys in her free time, from gardening and sailing to reading and rug hooking. Justice Gass, on behalf of the entire Nova Scotia Judiciary, congratulations on your retirement and we wish you many happy years with family and friends!